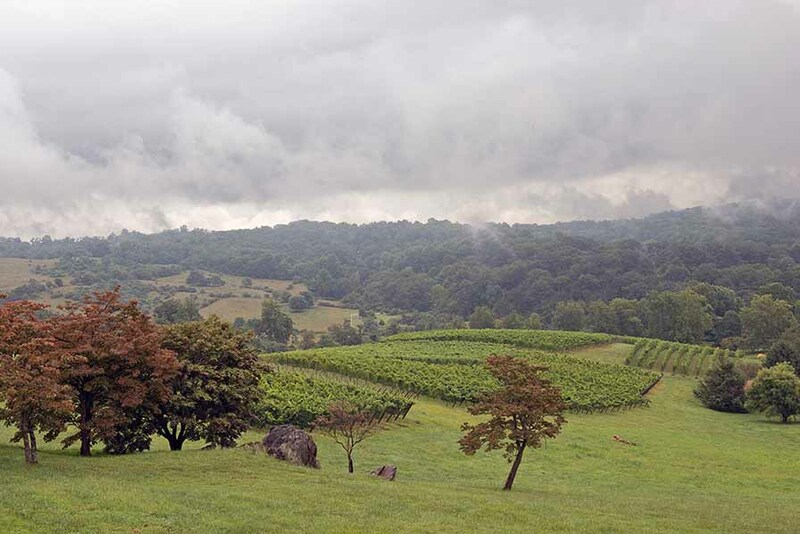 One of Virginia’s premier wineries, Linden Vineyards is located in the Blue Ridge Mountains, 60 miles west of Washington DC. The entire wine production of 4,000 cases comes exclusively from three distinct vineyard sites. Linden is best known for single vineyard bottlings of Chardonnay, Sauvignon Blanc, and Bordeaux variety red blends. Chardonnay planted in 1985 is now old growth. The land that was to become Linden Vineyards was a long-abandoned apple orchard. Jim Law and his family purchased the 76 acres in 1983 after several years of looking for vineyard land with high elevations and east facing slopes. After clearing trees, they planted the first eight acres in 1985. The original vines were mostly grafted and propagated in-house from budwood obtained from the few local vineyards in the surrounding area. The first planting consisted of Chardonnay, Cabernet Sauvignon, Cabernet Franc, Vidal, and Seyval. Heirloom apples and blueberries were also planted for a pick-your-own operation that was eventually phased out in the early 2000s. The winery building was finished in time for the harvest of 1987, Linden’s first commercial vintage. All the grapes used for wines produced at Linden Vineyards are grown on three sites. Hardscrabble is the estate vineyard of twenty acres surrounding the winery building. It includes some of the original vines planted in 1985. Avenius Vineyard is located just one mile north of the winery on a high ridge. This cool site was planted in 1996. Boisseau Vineyard is six miles west of the winery in the town of Front Royal. It is a warmer site situated on a west facing bluff overlooking the Shenandoah Valley. Jim is the owner of Linden Vineyards Ltd. and winegrower of Hardscrabble Vineyard. An Ohio native, he was raised in the 1960s and 1970s by parents who loved to share their passion for food and wine. Study in Europe and two years teaching agriculture as a Peace Corps Volunteer in Zaire (Congo) led to the desire to grow grapes. Jim’s first vineyard job was in Ohio where he learned the basics of grape growing and cellar work. In 1981 Jim was hired to start a winery in the Shenandoah Valley where he fell in love with the area and its viticultural possibilities. While establishing Linden Vineyards, he consulted for other wineries and taught winegrowing at local community colleges. He is obsessed with growing great wine and happiest in the vineyard where he spends most of his days. Shari is the general manager of Linden Vineyards (since 1990) and the owner and winegrower of Avenius Vineyard (since 1996). As in so many small businesses, her responsibilities at Linden are many and varied including lab technician, HR, accounting and bookkeeping, and during crush, press operator and pump-over specialist. She does all this in the afternoon. In the mornings she takes care of her own eponymous 5-acre vineyard. Richard is the owner and winegrower of Boisseau Vineyard and chief grape sorter during crush. His relationship with Linden started as a regular customer. In 2000, after taking some of Jim’s winegrowing classes he decided to plant his family’s home place in vines. Linden and Boisseau have worked together ever since. Jonathan is Linden’s winemaker. He came to Linden as an apprentice in 2010 with five years of experience already under his belt. He was asked to stay on at Linden as cellarmaster after his two-year apprenticeship. He officially became Linden’s winemaker in 2016. Fully embracing Linden’s philosophy, Jonathan continues to spend more time in the vineyard than in the cellar.